When we have students with special needs enter our classroom, we aren’t always sure what the best ways to help them might be. We’re pleased to have Kathleen from A+ Kids Bloggin’ talk about helping children thrive in special education in her guest blog post below. She shares an experience that she went through with a student who came into her classroom and tips for other special education teachers to find success. I was teaching third grade in a self-contained special education classroom when I got a message to call the Director of Special Education. He wanted me to know that Ms. Carroll, a resource room teacher from another school, would be calling to set up an appointment for herself and a parent to visit my room and discuss our program. 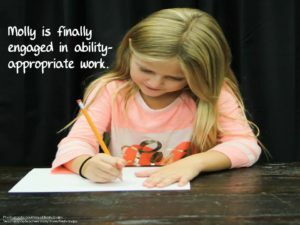 The resource teacher was recommending a self-contained placement for the parent’s daughter, Molly, and the parent was extremely apprehensive about consenting to have her daughter placed in a self-contained special education program. The purpose of the visit was to reassure the mom that the placement was not some sort of a dumping ground with the kids running wild as she imagined but rather a vibrant classroom full of great kids, wonderful learning opportunities, and collaboration fostering the success of the students. My class had three different levels of groups for each subject: reading, math and writing. So, a student could be in a third grade math group, a first grade reading group, and a first grade writing group. The kids were placed according to their ability levels, and we worked from there, always trying to move them to the next level as soon as possible. After our morning routine, the rest of our morning was spent in small group lessons. Our class usually spent the afternoon working on a class project that reflected the morning work, with everyone contributing according to his talents. Like any general education class, our class had some fabulous artists, who created beautiful illustrations to enhance our projects. Everyone was encouraged to use their creativity to make our projects better. The kids often added pertinent comments and ideas I might never have thought to include. We were truly a community of learners. From a casual observer’s point of view, my class was very much like any general education class. There were interesting materials, rules to be followed, and lots of collaboration about what we were learning, but academically, there were big differences. My kids had learning problems and definitely were functioning years below their chronological grade levels in reading, math, or both. They did not, and most likely never would, belong to the “eagles” reading group. Yet, here in our little community of learners, measurable progress was being made. They all belonged. There were no outcasts, something many of them had been in their general education classes. The kids were learning, and most of all, they were happy, successful learners. On the morning of Ms. Carroll and Molly’s mom’s visit, I made sure that the many wonderful materials the children had created were on display for the parent to see. Books, created by the kids, that were usually kept in our class library were out on a table, along with other authentic student-created projects. When Ms. Carroll and Molly’s mom arrived a few minutes early, I told the office to send them right down. Ms. Carroll introduced us, and then I excused myself to walk my class to the gym. By the time I got back, Molly’s mom felt a little more reassured that maybe this placement was not as bad as she had imagined. She had questions, lots of questions, about the curriculum and the other children in the class. What would Molly be learning? Were the other kids violent? Were there fights? As any responsible parent would be, she was concerned about her daughter’s education and safety. She felt more reassured about Molly’s potential classmates since she had observed them following directions to finish their work and line up quietly for gym class. This year brought lots of excuses as to why Molly couldn’t go to school. Every morning Molly had a new one: “My stomach aches,” “My head hurts,” and the last straw, “My hair hurts.” Really, Molly, your hair hurts? It was heart-breaking watching this mother trying to decide what was best for her very unhappy child. A few weeks later, Molly was a new student in my class. She was an absolutely delightful, loquacious third grader. She made friends easily and adjusted nicely. She loved participating in ability-level academic groups and immersed herself in our projects. She became a happy learner! Was she on grade-level by the end of the year? No, certainly not, but she had found a place where she could comfortably participate, and she was making progress! 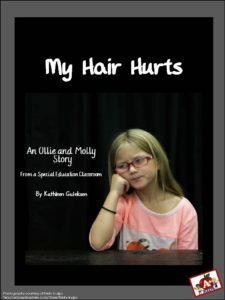 At a parent-teacher conference later in the year, Molly’s mom thanked me for “giving me back my daughter; the old happy Molly has returned.” All of her pains had gone away, and her hair was just fine! That’s why I loved being a special education teacher. The kids with learning disabilities were in my class for a reason. Working in ability-level groups, and then being engaged in academic activities and projects, gave the kids the self-confidence to realize that they were can-do kids! They were finally among the kids who enjoyed learning, and I enjoyed helping each of them to realize their own potential. They were all A+ kids in their own right. The art of being a good teacher is to keep all of your students engaged in learning at the same time. With many varying abilities in one class it can be a challenge, but with careful planning, it can be done. Teaching reluctant learners, many of whom have experienced years of failure in school, can be a real challenge. We need to remember that kids who don’t feel they have a chance to be successful give up. Then we have lost them. It is our job not to let that happen. Here are a few ideas teachers might try to engage less able learners in literacy and content area subjects. Involve kids in hands-on projects. Everyone can participate, and everyone will experience some degree of success. The more you use hands-on materials, the more confident your kids will become, and they will WANT to participate. Use differentiated resources to help less able learners begin experiencing success. Create a few different ways to reinforce the same concepts. Rotate members of your groups regularly. Kids need to feel as though they are part of the group and not excluded from the more able learners. Be sure to communicate with parents regularly. 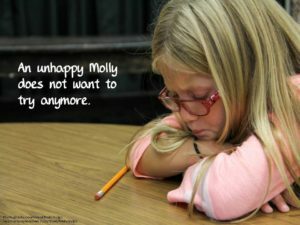 Like Molly’s mom, many parents are very anxious about their kids, who are having difficulty in school. Most parents want to support you. 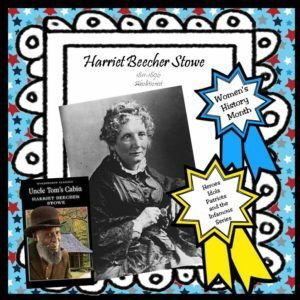 I would like to share my freebie, Harriet Beecher Stowe: Abolitionist, with you. 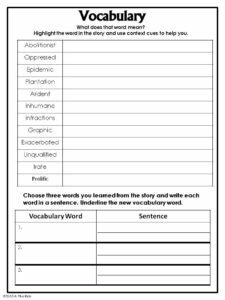 Because it is a freebie, it is short, but it does have some good examples of comprehension skills to help your students determine meaning from a passage. Develop a pre-reading strategy. The best thing is that learners do not have to be knowledgeable about the content area to become engaged. 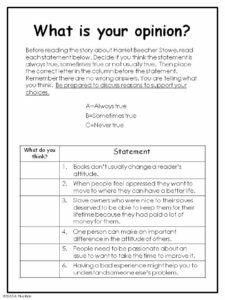 Examples: Students give an opinion on a given statement; students state whether they agree or disagree with a given statement. Use subtitles to help students make predictions. When stories are broken into smaller sections, it becomes easier for kids to comprehend the meaning of each section. If the content area text you are using does not have subtitles, then you can add them. Write them in before making copies or use sticky notes. Underline the main idea in each section or write it on a post-it. It is easier to determine the main idea of a smaller section. Understanding vocabulary is a must. Many times kids can determine the meaning of new vocabulary words presented in a passage by using context cues. 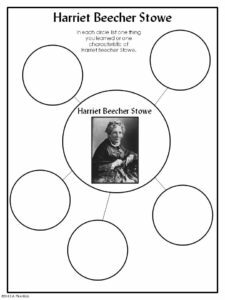 Graphic organizers create an easy format to help kids record important information. I hope these examples have given you some inspiration to be sure the less able learners in your classroom feel included and successful. Before teachers can expect any real progress, we need to convince those kids that they truly do belong in our community of learners. Only then will they feel confident enough to participate in our classrooms. Only successful experiences will inspire that confidence. (Cambourne) No one wants the heart-breaking story of Molly’s general education experience repeated in their classroom or a parent feeling as if their child was thrown away “like an old shoe.” It shouldn’t happen! Develop your own resources with varied levels or try one of mine. If you have a question about a particular resource, email me. I’ll be happy to try to help you. Kathleen Guleksen is a retired Special Education teacher with over 20 years experience teaching elementary and middle school special education classes in a lower socio-economic public school. Kathleen’s philosophical belief is that all students need opportunities to be active participants engaging in successful experiences. 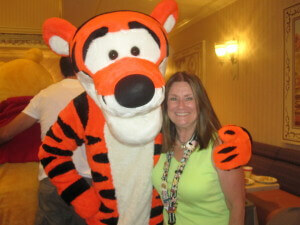 Visit her blog, A+ Kids Bloggin, and her Teachers Pay Teachers store for more examples of differentiated instruction. I agree. Less able students just need a more individual approach. They are good kids you just have to find a method that works for them. Kathleen I am reading aide preparing to be a teacher. I really struggle with making the classroom diversified with different paced learners. I found encouragement reading about Molly. Yesterday I was subbing doing whole group math. I had a student falling behind because he was needing to process things longer (oh how could I accommodate him better)….rest of class was done and he was about to cry. Walked away feeling I left him behind like Molly felt. Do you have suggestions for me or books I could read or other resources? Thanks for your help!